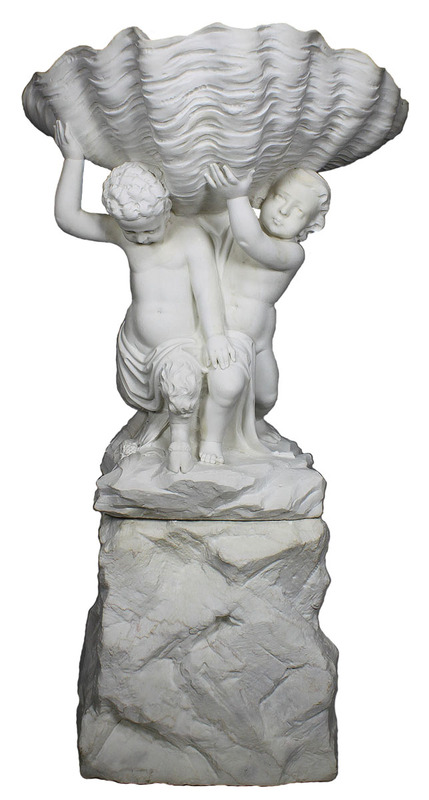 A Very Fine Italian 19th Century Carved Carrara Marble Figural Fountain "Jardinière" Modelled as a Standing Putto and a Satyr Supporting a Sea-Shell, on a Rockwork Base (Drilled for water). Attributed to Giovanni Battista Lombardi (Italian, 1823-1880). Inscribed: G.B. Lombardi, 1860. Circa: 1860. 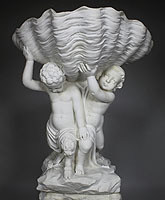 Lombardi's handling of large marble compositions distinguished him from his 19th-century Roman counterparts. His skill was born of his apprenticeship as a young man in his father's marble quarry in Rezzato. Even though Giovanni Battista Lombardi moved to Rome to expand his horizons as an artist, throughout his career much of his work was directed toward his native Brescia. In Rome Lombardi apprenticed under Pietro Tenerari, a follower of Thorvaldsen. Eventually Lombardi established his own studio with his brother Giovita. Giovanni was the more inventive of the siblings, whereas his brother concentrated mainly on still life and architectural sculpture, he produced fine portrait busts, commemorative sculpture and large secular and religious commissions. Lombardi's style is one of Romantic realism with a penchant for orientalist themes. 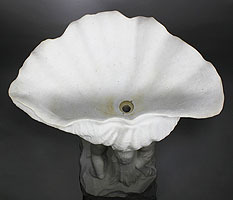 His talent is manifest in his naturalistic marble carving. Lombardi's most prestigious commission was the monument to the Martiri del 1849 for Vittorio Emanuele II in 1862 (Brescia). Many of his emotionally charged female figures are derived from the old testament including Deborah, Ruth, Suzanna or as in the present marble of Rebecca. RELATED LITERATURE: Vicario, vol. 2, pp. 614-619; Panzetta, vol. 1, p.67. 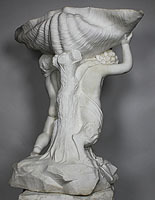 A Very Fine Italian 19th Century Carved Carrara Marble Figural Fountain "Jardinière" Modelled as a Standing Putto and a Satyr Supporting a Sea-Shell, on a Rockwork Base (Drilled for water). Attributed to Giovanni Battista Lombardi (Italian, 1823-1880). Inscribed: G.B. Lombardi, 1860. Circa: 1860. Lombardi's handling of large marble compositions distinguished him from his 19th-century Roman counterparts. His skill was born of his apprenticeship as a young man in his father's marble quarry in Rezzato. Even though Giovanni Battista Lombardi moved to Rome to expand his horizons as an artist, throughout his career much of his work was directed toward his native Brescia. In Rome Lombardi apprenticed under Pietro Tenerari, a follower of Thorvaldsen. Eventually Lombardi established his own studio with his brother Giovita. Giovanni was the more inventive of the siblings, whereas his brother concentrated mainly on still life and architectural sculpture, he produced fine portrait busts, commemorative sculpture and large secular and religious commissions. Lombardi's style is one of Romantic realism with a penchant for orientalist themes. His talent is manifest in his naturalistic marble carving. Lombardi's most prestigious commission was the monument to the Martiri del 1849 for Vittorio Emanuele II in 1862 (Brescia). Many of his emotionally charged female figures are derived from the old testament including Deborah, Ruth, Suzanna or as in the present marble of Rebecca. Vicario, vol. 2, pp. 614-619; Panzetta, vol. 1, p.67.